The Federal Security Service of the Russian Federation (FSB; Russian: Федеральная служба безопасности Российской Федерации (ФСБ), tr. Federal'naya sluzhba bezopasnosti Rossiyskoy Federatsii; IPA: [fʲɪdʲɪˈralʲnəjə ˈsluʐbə bʲɪzɐˈpasnəstʲɪ rɐˈsʲijskəj fʲɪdʲɪˈratsɨjɪ]) is the principal security agency of Russia and the main successor agency to the USSR's Committee of State Security (KGB). Its main responsibilities are within the country and include counter-intelligence, internal and border security, counter-terrorism, and surveillance as well as investigating some other types of grave crimes and federal law violations. It is headquartered in Lubyanka Square, Moscow's centre, in the main building of the former KGB. The Director of the FSB since 2008 is army general Aleksandr Bortnikov. The immediate predecessor of the FSB was the Federal Counterintelligence Service (FSK) of Russia, itself a successor to the KGB: on 12 April 1995, Russian president Boris Yeltsin signed a law mandating a reorganization of the FSK, which resulted in the creation of the FSB. In 2003, the FSB's responsibilities were widened by incorporating the previously independent Border Guard Service and a major part of the abolished Federal Agency of Government Communication and Information (FAPSI). The two major structural components of the former KGB that remain administratively independent of the FSB are the Foreign Intelligence Service (SVR) and the State Guards (FSO). Under Russian federal law, the FSB is a military service just like the armed forces, the MVD, the FSO, the SVR, the FSKN and EMERCOM's civil defence, but its commissioned officers do not usually wear military uniforms. The FSB is mainly responsible for internal security of the Russian state, counterespionage, and the fight against organized crime, terrorism, and drug smuggling. 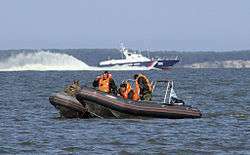 Since 2003, when the Federal Border Guards Service was incorporated to the FSB, it has also been responsible for overseeing border security. The FSB is engaged mostly in domestic affairs, while espionage duties are responsibility of the Russian Foreign Intelligence Service. However, the FSB also includes the FAPSI agency, which conducts electronic surveillance abroad. All law enforcement and intelligence agencies in Russia work under the guidance of FSB, if needed. The FSB combines functions and powers similar to those exercised by the United States FBI National Security Branch, Immigration and Customs Enforcement (ICE), the Federal Protective Service, the National Security Agency (NSA), U.S. Customs and Border Protection, United States Coast Guard, and partly the Drug Enforcement Administration. 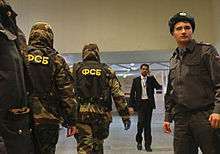 The FSB employs about 66,200 uniformed staff, including about 4,000 special forces troops. It also employs about 160,000–200,000 border guards. Under Article 32 of the Federal Constitutional Law On the Government of the Russian Federation, the FSB head answers directly to the RF president and the FSB director is the RF president's appointment, though he is a member of the RF government which is headed by the Chairman of Government; he also, ex officio, is a permanent member of the Security Council of Russia presided over by the president and chairman of the National Anti-terrorism Committee of Russia. FSB medal for "distinguished military service". The FSB had overall command of the federal forces in Chechnya in 2001–2003. 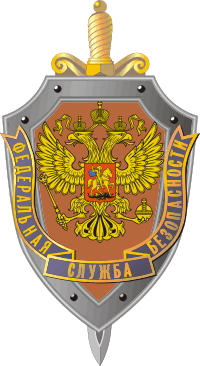 In 1995, the FSK was renamed and reorganized into the Federal Security Service (FSB) by the Federal Law of 3 April 1995, "On the Organs of the Federal Security Service in the Russian Federation". The FSB reforms were rounded out by decree No. 633, signed by Boris Yeltsin on 23 June 1995. The decree made the tasks of the FSB more specific, giving the FSB substantial rights to conduct cryptographic work, and described the powers of the FSB director. The number of deputy directors was increased to 8: 2 first deputies, 5 deputies responsible for departments and directorates and 1 deputy director heading the Moscow City and Moscow regional directorate. Yeltsin appointed Colonel-General Mikhail Ivanovich Barsukov as the new director of the FSB. In 1998 Yeltsin appointed Vladimir Putin, a KGB veteran who would later succeed Yeltsin as federal president, as director of the FSB. Putin was reluctant to take over the directorship, but once appointed conducted a thorough reorganization, which included the dismissal of most of the FSB's top personnel. Putin appointed Nikolai Patrushev as the head of FSB in 1999. After the main military offensive of the Second Chechen War ended and the separatists changed tactics to guerilla warfare, overall command of the federal forces in Chechnya was transferred from the military to the FSB in January 2001. While the army lacked technical means of tracking the guerrilla groups, the FSB suffered from insufficient human intelligence due its inability to build networks of agents and informants. In the autumn of 2002, the separatists launched a massive campaign of terrorism against the Russian civilians, including the Dubrovka theatre attack. 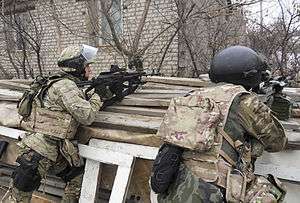 The inability of the federal forces to conduct efficient counter-terrorist operations led to the government to transfer the responsibility of "maintaining order" in Chechnya from the FSB to the Ministry of Internal Affairs (MVD) in July 2003. In 2011, the FSB said it had exposed 199 foreign spies, including 41 professional spies and 158 agents employed by foreign intelligence services. The number has risen in recent years: in 2006 the FSB reportedly caught about 27 foreign intelligence officers and 89 foreign agents. Comparing the number of exposed spies historically, the then-FSB Director Nikolay Kovalyov said in 1996: "There has never been such a number of spies arrested by us since the time when German agents were sent in during the years of World War II." The 2011 figure is similar to what was reported in 1995–1996, when around 400 foreign intelligence agents were uncovered during the two-year period. In a high-profile case of foreign espionage, the FSB said in February 2012 that an engineer working at the Plesetsk Cosmodrome, Russia's main space center for military launches, had been sentenced to 13 years in prison on charges of state treason. A court judged that the engineer had sold information about testing of new Russian strategic missile systems to the American CIA. An increasing number of scientists have been accused of espionage and illegal technology exports by the FSB during the last decade: researcher Igor Sutyagin, physicist Valentin Danilov, physical chemist Oleg Korobeinichev, academician Oskar Kaibyshev, and physicist Yury Ryzhov. Ecologist and journalist Alexander Nikitin, who worked with the Bellona Foundation, was accused of espionage. He published material exposing hazards posed by the Russian Navy's nuclear fleet. He was acquitted in 1999 after spending several years in prison (his case was sent for re-investigation 13 times while he remained in prison). Other cases of prosecution are the cases of investigative journalist and ecologist Grigory Pasko, Vladimir Petrenko who described danger posed by military chemical warfare stockpiles, and Nikolay Shchur, chairman of the Snezhinskiy Ecological Fund. Other arrested people include Viktor Orekhov, a former KGB officer who assisted Soviet dissidents, Vladimir Kazantsev who disclosed illegal purchases of eavesdropping devices from foreign firms, and Vil Mirzayanov who had written that Russia was working on a nerve-gas weapon. President's regiment in the Service of the Commandant of the Moscow Kremlin of the Federal Security Service of Russia (Russian: Президентский полк Службы коменданта Московского Кремля ФСО России) stationed in Kremlin. 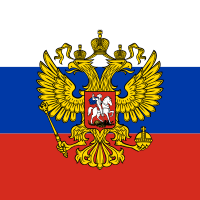 Was created on 8 April 1936 as a special regiment (Spetsnaz) for the security of the Kremlin Garrison. Besides the services (departments) and directorates of the federal office, the territorial directorates of FSB in the federal subects are also subordinate to it. Of these, St. Petersburg and Leningrad Oblast Directorate of FSB and its predecessors (historically covering both Leningrad/Saint Petersburg and Leningrad Oblast) have played especially important roles in the history of this organization, as many of the officers of the Directorate, including Vladimir Putin and Nikolay Patrushev, later assumed important positions within the federal FSB office or other government bodies. After the last Chief of the Soviet time, Anatoly Kurkov, the St. Petersburg and Leningrad Oblast Directorate were led by Sergei Stepashin (29 November 1991 – 1992), Viktor Cherkesov (1992 –1998), Alexander Grigoryev (1 October 1998 – 5 January 2001), Sergei Smirnov (5 January 2001 – June 2003), Alexander Bortnikov (June 2003 – March 2004) and Yury Ignashchenkov (since March 2004). The FSB has been criticised for corruption and human rights violations. Some Kremlin critics such as Yulia Latynina and Alexander Litvinenko have claimed that the FSB is engaged in suppression of internal dissent; Litvinenko died in 2006 as a result of polonium poisoning. A number of opposition lawmakers and investigative journalists were murdered in the 2000s while investigating corruption and other alleged crimes perpetrated by FSB officers: Sergei Yushenkov, Yuri Shchekochikhin, Galina Starovoitova, Anna Politkovskaya, Alexander Litvinenko, Paul Klebnikov (US), Nadezhda Chaikova, Nina Yefimova, and others. The FSB has been further criticised by some for failure to bring Islamist terrorism in Russia under control. In the mid-2000s, the pro-Kremlin Russian sociologist Olga Kryshtanovskaya claimed that FSB played a dominant role in the country's political, economic and even cultural life. FSB officers have been frequently accused of extortion, bribery and illegal takeovers of private companies, often working together with tax inspection officers. Active and former FSB officers are also present as "curators" in "almost every single large enterprise", both in public and private sectors. Konstantin Preobrazhenskiy criticised the continuing celebration of the professional holiday of the old and the modern Russian security services on the anniversary of the creation of the Cheka: "The successors of the KGB still haven't renounced anything; they even celebrate their professional holiday the same day, as during repression, on the 20th of December. It is as if the present intelligence and counterespionage services of Germany celebrated Gestapo Day. I can imagine how indignant our press would be!" In the same time, in 2007, during a memorial to the victims of the 1937 Great Purge at Butovo firing range Vladimir Putin honored the victims of the Stalin's purge and told the audience that the Great Purge was prepared by the years of the previous hostilities of the Soviet regime including extermination of entire strata of the society: clergy, Russian peasantry and the Cossacks. In his speech Putin mainly criticized the Red Terror under the lead of Felix Dzerzhinsky as the then Cheka head, which resulted in the deaths of thousands, including opponents of the regime and the clergy. 1 2 3 4 5 6 Sakwa, Richard. Russian Politics and Society (4th ed.). p. 98. ↑ "Федеральный конституционный закон "О Правительстве Российской Федерации". kremlin.ru. 17 Dec 1997. ↑ THE MILITARY AND THE AUGUST 1991 COUP McNair Paper 34, The Russian Military's Role in Politics, January 1995. ↑ Gevorkian, Natalia (January 1993). 'The KGB: "They still need us"'. Bulletin of the Atomic Scientists. pp. 36–39. ↑ On Organs of the Federal Security Service in the Russian Federation Russian Federation Federal Law No. 40-FZ. 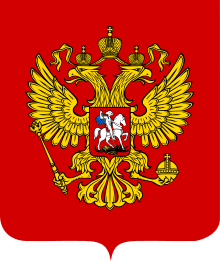 Adopted by the State Duma 22 February 1995. Signed by Russian Federation President B. Yeltsin and dated 3 April 1995. 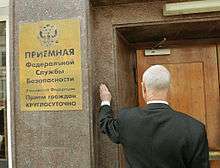 ↑ "Mass Dismissals at the FSB – Kommersant Moscow". Kommersant.com. Retrieved 4 November 2010. ↑ Biberman, Yelena (6 December 2008). "No Place to Be a Terrorist". Russia Profile. ↑ "'Terror' list out; Russia tags two Kuwaiti groups". Arab Times. 13 August 2006. Retrieved 13 August 2006. ↑ "Murov biography (in Russian)". Fso.gov.ru. Retrieved 4 November 2010. ↑ "Президентский полк". Ppolk.ru. Retrieved 4 November 2010. ↑ "David Satter – House committee on Foreign Affairs" (PDF). Retrieved 2012-01-29. ↑ Russian Federation: Amnesty International's concerns and recommendations in the case of Mikhail Trepashkin – Amnesty International Archived 10 September 2009 at the Wayback Machine. ↑ Evangelista, Matthew (2002), The Chechen Wars: Will Russia Go the Way of the Soviet Union?, Brookings Institution Press, ISBN 978-0-8157-2499-5 , p. 81. ↑ Article of Konstantin Preobrazhenskiy: "People’s Commissariat of Internal Affairs and Gestapo: cooperation of friends"
↑ History of creation of the FSB on the official website of FSB (English translation). ↑ Russian holidays and celebrations info: "December 20 - The day of national security service workers (professional holiday)".